First off, the is no #2 wastegate. there is only one wastegate and it comes off the #1 turbo because that turbo is always on line, therefore you always have a wastegate. there are 4 sets of vsv’s, actuators, and control valves for the sequential turbo system. Each vsv is simply a solenoid that is either 100% open or closed, allowing manifold pressure to pressurize the different actuators that open/close the four different valves. Somewhere around 3500 rpm, the ecu sends a signal to the exhaust gas bypass valve vsv, which allows manifold pressure to build in the exhaust gas bypass valve actuator which opens the bypass valve. this is a small opening inside the #2 turbine housing which allows some exhaust gas to go through the turbine of the #2 turbo which makes it start spinning, and dumps the exhaust gas out the exhaust piping coming off of #1 turbo. since it is a small amount of exhaust gas, it pre-spools the turbo and does not get it up to full operating speeds. this will smooth out the transition from 1 to 2 turbos. This valve is similar to a wastegate in design, but is located after the turbine wheel instead of in front of the turbine wheel like a wastegate would be. this is not a wastegate! This valve is located in the exhaust piping downstream of the #2 turbo. when this valve is closed, all exhaust gas must go through the #1 turbine wheel to get out through the rest of the exhaust system. at around 4000 rpm, the ecu sends a signal to the exhaust gas control valve vsv, which allows manifold pressure to build in the exhaust gas control valve actuator which opens the control valve. this allows exhaust gas to go through #2 turbo and out the exhaust system which brings the #2 turbo up to full operating speed. This valve is located in the intake tract coming off of #2 turbo. it is closed below 4000 rpm so that boost pressure coming off of #1 turbo cannot backup through the #2 turbo and back out the air cleaner/suction of #1 turbo. there is also a 1 way reed valve within the same housing of the intake air control valve. as the #2 turbo starts to pre-spin at 3500 rpm, it will build some boost. if it builds enough boost, it will open the 1 way reed valve to allow this boost into the intake tract to join with the discharge boost pressure coming off of #1 turbo. at somewhere over 4000 rpm, the ECU sends a signal to the intake air control valve vsv, which allows manifold pressure to build in the intake air control valve actuator which opens the control valve. this allows the full boost pressure coming off #2 turbo to join in with that coming from #1 turbo and you are now fully on line. Usually, the exhaust gas control valve will open first, which gets the #2 turbo spinning at full rate so that it is building good boost before the intake air control valve opens, allowing this boost to join in with that coming off #1 turbo. if the intake air control valve opens before the exhaust gas control valve, the boost pressure coming off #1 turbo will go backwards through #2 turbo, spinning it backwards if there isn’t sufficient exhaust energy to keep it spinning forward. when the exhaust gas control valve opens, and the #2 turbo has to reverse the direction of the spin. this is a tremendous strain on the turbo shaft and bearings. One method is to use a pressure switch which is used for cutting off the signal to the Intake air control valve VSV so the #2 turbo has a time to build up pressure so when the changeover point between the two turbo’s occurs the “dip” in boost isn’t so prominent. To wire in, find an accessable wire to the “Intake air control valve” (IACV) vsv and cut it so a wire joining lug can be crimped in. Use two of each male and female joiners and allow for disconnection of the pressure switch and reconnect vsv back to normal if needed. 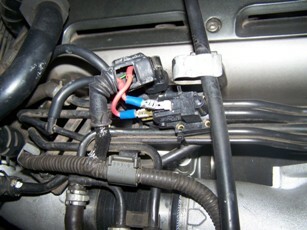 Any wire can be cut that leads to the VSV as any can be switched. 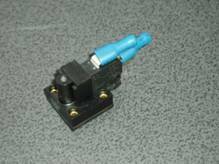 Plug these into the two top terminals of the pressure switch. This setup won’t let the VSV activate until the desired boost pressure. Mount the switch where desired but on the fire wall or out of site is better. Run a boost pressure line that is sourced AFTER rear turbo compressor housing to the pressure switch hose connection. To adjust while tuning ,locate the tiny allen key adjustment screw on the top of the switch and turn so that the #1 turbo boost to a bout 13-14 psi before changeover. Although the pressure switch should already be set it should always be checked while tuning. Fully cleaned and dressed to appear"new"
Fully balanced including core balancing and speed testing.